You know when you take a bite of food and think, man that’s good. And then you take a second bite, and think, wow this is delicious. 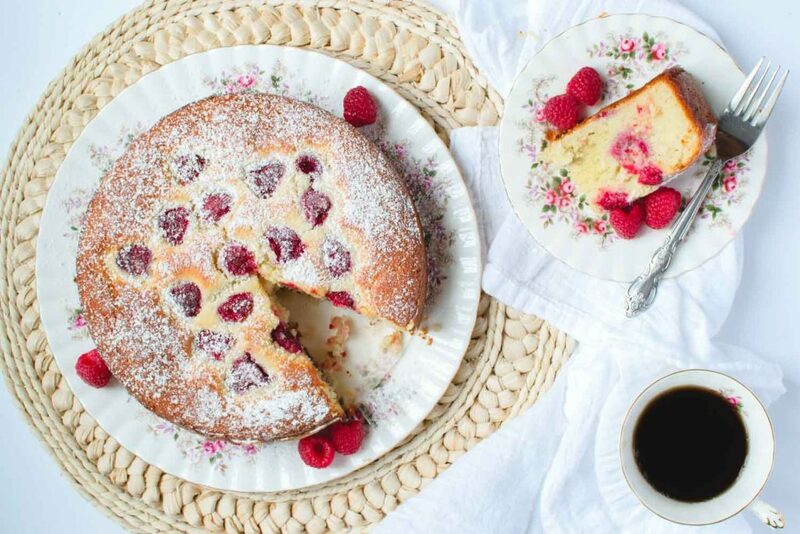 Well that’s what happens when you eat this raspberry coconut ricotta cake. At least, that’s what happened when my family ate it. Even the next day they couldn’t stop exclaiming how much they loved this cake. So take my word for it, if you like raspberries, coconut and ricotta, you have to make this. Alright you say, but what makes it so good? Well, the combination of coconut and raspberries for one. It’s a flavour combination that is out of this world delicious. Then you’ve got the ricotta and buttermilk, which makes the cake moist and decadent, but not too heavy. Next up, we’ve kept the sugar on the low side, so it isn’t overly sweet, meaning you won’t crash after eating it. And finally, it is easy to make. Have I convinced you yet? Oh, and it is the best with a cup of tea… or coffee, whatever floats your boat. To make the cake easy to remove from the pan, we grease with a bit of butter, then cut parchment paper to line the bottom and sides of the pan. If you don’t know how to do this, just trace the bottom of the pan on a piece of parchment and cut slightly smaller then the outline. The sides only need straight strips of parchment. If your cake starts browning before the middle is cooked, cover the pan with some tin foil. This will trap the heat and help the cake cook faster, while reducing how quickly it is browning. I had to do this for my cake and it usually means the oven is too hot, so if you know your oven runs hot, you can reduce the heat to 325F. My cake cooked in 65 minutes, but start checking at 55 minutes, as everyone’s oven is different. You can use frozen berries, just don’t let them defrost first. You may also require a bit more cooking time as this will cool the batter down. Small edit to add this note: I Thought I had cooked this is a 9inch pan, turns out it was 8 jnch. So you can cook this is a 9 inch instead, but know you’ll have to reduce your cooking time, so start checking at 45 or 50 minutes. I’ve changed the recipe to say 8 inch pan. 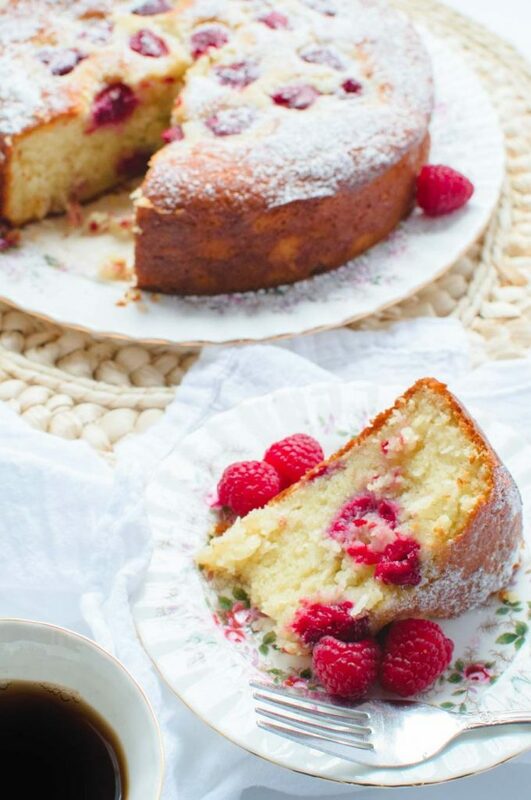 A moist and lightly sweetened cake with a delicate coconut raspberry flavour. Preheat oven to 350F and grease and line an 8 inch cake pan with parchment paper. In a large bowl, using an electric mixer, beat the eggs and ricotta cheese together until smooth. Add the vanilla, buttermilk and sugar and beat together until combined. In a separate bowl, whisk together the dry ingredients. Add the flour mixture to the egg mixture in two parts, mixing until just combined after each time. Pour the melted butter over the batter and stir gently until combined. Add 2/3 of the raspberries to your batter and mix gently. Pour into your prepared pan and top with remaining 1/3 cup raspberries. Bake for 55-65 minutes, until a skewer inserted in the center of the cake comes out clean. If the batter begins to brown too quickly (before center is cooked), top with some aluminum foil and continue to check for doneness every 5 minutes. Cool on a rack in the pan for 5 minutes before removing cake from pan. Let cool completely before cutting.